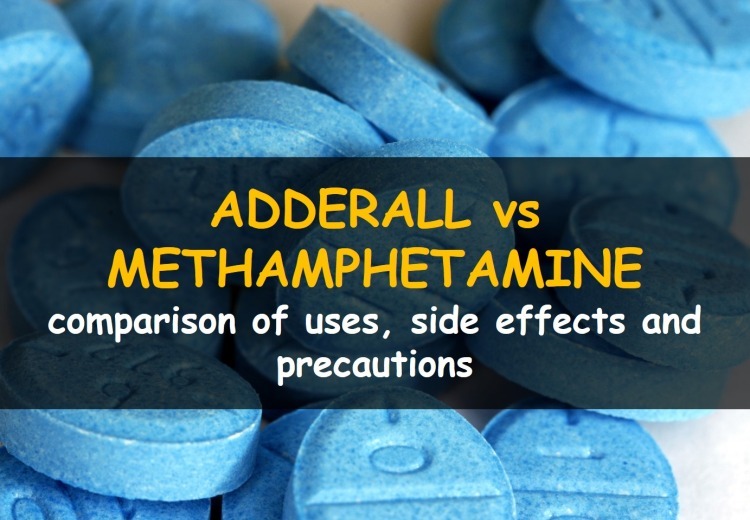 Home / Drugs & Supplements / What is the difference between adderall and methamphetamine? Have you heard of medicines that make you alert, active and euphoric? Yes, there are certain medicines like amphetamine and methamphetamine that can suddenly boost your mood up and fill you up with mental and physical energy. The euphoric potential of these drugs bestowed them with the name of “club drugs” as these drugs can be highly abused for addiction and recreational purposes. A question might hit the mind now that how does a drug like this can be used a medicine? No doubt, these stimulant drugs can cause addiction but, at the same time these drugs have also got some medical uses too. These CNS stimulant drugs are quite helpful in treating some psychiatric disorders that will be discussed in the upcoming sections of the article. Attention deficit hyperactivity disorder is the psychiatric disorder of children. Although it is the disorder of childhood, yet some young adults can suffer from it too. In this disorder child becomes hyperactive and hyperkinetic with the inability to maintain interest in a certain activity for more than a few minutes. Children having ADHD suffer from lack of concentration ability and have poor academic performance. In ADHD the development of brain neuronal cells is not proper and the chemical activity in neuron transmission is not up to the mark that is required for good cognitive function. Therefore, when amphetamine is given is such patients, there is marked improvement seen in behavioral and cognitive function of the patient as amphetamine tends to enhance the chemical activity in the neuronal cells (1, 2). Narcolepsy is a rare sleep disorder characterized by excessive bouts of sleep during daytime. Peoplesuffering from narcolepsy have disturbed sleep pattern with frequent naps during day time and episodes of wakefulness during nighttime. It is associated with symptoms of lethargy, fatigue, muscle weakness and repeated attacks of sleep paralysis. The exact cause of narcolepsy is still a mystery. However, the use of amphetamines causes psycho stimulation and improves the alertness in these patients. Above mentioned conditions are the primary indications for the use of amphetamine. But there are some other conditions in which amphetamines can be used, only when all other treatment options fail to improve the patient’s condition. One such example is the treatment of obesity because amphetamine tends to reduce appetite and hunger in obese patients. Besides its use in obesity, amphetamine occasionally can be used for treating those cases of depression that cannot be controlled through other medications. Amphetamines are not recommended for the treatment of children under 3 years of age. In children with age of 3-5 years, treatment is started with a low dose of 2.5mg daily. Dose increment can be done by adding 2.5mg after every week, depending upon the response of patient to the treatment. However, the maximum dose must not exceed 30mg daily. In children above the age of 6 years, the recommended starting dose is 5mg once or twice a day. Then an addition of 5mg can be made every week after checking the patient’s response to drug. But, the maximum dose of adderall must not exceed 40mg per day. For children 6-12 years of age, initial dosage is 5mg per day. Then an increment of 5mg per week can be made afterwards gradually. For patients above 12 years of age, initial dose of drug is 10mg per day and then a gradual addition of 10mg can be made every week, depending upon the patient’s response and improvement. The recommended dose in narcolepsy should not exceed 60mg. Adderall extended release capsule: Adderall comes in the form of extended release capsules with varying strengths such as 5mg, 10mg, 15mg, 20mg, 25mg and 30mg. These capsule forms are indicated for use in adults and children above the age of 6 years. Do not crush or break open the capsule. Just swallow with a glass of water as such. Adderall tablets: Adderall comes in the tablet form too with different strengths. Calculate the right amount of dose as prescribed by doctor and swallow the tablet with a large glass of water. The only precautionary measure that needs to be kept in mind before using adderall is to calculate the correct dosage of the drug. Never start taking this stimulant drug without consulting the doctor. Always keep record of the drug intake. Fix that time of day when you take medicine and try to stick to this time daily. Adderall should be avoided at night time as it can cause insomnia and sleep disturbance. The best time to take medicine is in the morning. Activities that require fine coordination such as driving should be done with great caution after taking this drug. Adderall should not be used in patient with anxiety disorders, glaucoma and heart diseases as it can worse their condition. Pregnant and lactating women should consult the doctor first before taking this medicine. Tell the doctor beforehand if there is any history of mental illness, psychosis, high blood pressure and epilepsy. Never stop taking medicine abruptly, as suddenly withdrawing the medicine can result in withdrawal symptoms. If you are using other medicines as well, tell the doctor because amphetamine can have serious interactions with other drugs that can cause serious health hazards. As adderall is composed of CNS stimulant amphetamines, it tends to boost up the synaptic transmission in neuronal circuits. But how does it do so? Brain neuron cells are connected to each other with a space between them called synapse. Presynaptic neurons release chemical substances in synapse called neurotransmitters which act as chemical messengers from neuron to neuron. These neurotransmitters attach to the receptor sites on postsynaptic neuron and in turn activate it. This is how the brain cells work and transmit their message from one neuron to another. When these neurotransmitters are done with their work, they are either metabolized by enzymes present in synapse or are re-up taken through presynaptic neuron. This is the point where amphetamines come to act. Amphetamine inhibits the reuptake of dopamine, epinephrine and norepinephrine, the neurotransmitters that are responsible for causing euphoria, mood boosting and alertness. When the re uptake process in blocked by amphetamine, the concentration of these neurotransmitters are raised in the synapse which improves the synaptic transmission and brain activity. After inhibiting the reuptake of these neurotransmitters, amphetamines tend to act on the intracellular stores of these neurotransmitters. Amphetamines act on storage vesicles and force them to increase the release of more and more neurotransmitter in the synapse, thereby further increasing their concentration in the synaptic space (3, 6). Amphetamines are easily absorbed through gut when taken through oral route. Oral bioavailability is about 75 percent. However, when it is taken through injection, the bioavailability is about 100 percent but, this route of intake is not appropriate for therapeutic use. The peak plasma concentration of drug reaches within 3 hours. Food intake does not have any significant affect on absorption of amphetamines. After reaching the peak plasma concentration, amphetamine is distributed throughout the body with the main concentration reaching the brain and cerebrospinal fluid. Amphetamines are highly lipid soluble so they easily cross the blood brain barrier and enter the brain tissues. Plasma protein binding percentage of amphetamines is about 20 percent. 30 percent of the drug remains in unchanged form but, the rest of it is metabolized in liver through the action of CYP2D6 enzymes. The main route of excretion is via kidneys. The plasma half life of amphetamine is about 8-12 hours. The half life of drug depends upon the pH of urine. Acidity of urinary pH reduces the plasma half life of amphetamine. On the other hand, the alkaline pH of urine increases the plasma half to about 16-30 hours because alkaline pH of urine reduces the urinary excretion of drug. Monoamine oxidase inhibitor drugs show severe drug interactions with adderall (7). Those who are taking MOA inhibitor should never think of taking adderall as these medicine can potentiate the side effects of adderall up to many folds. Tricyclic antidepressants also interfere with the action of adderall so the use of these drugs must be discontinued before starting adderall. Use of antacids should be avoided as they make the pH of stomach alkaline and increase the drug absorption, enhancing the chances of side effects. Herbal supplements should be used after consulting physician. Use of acidifying drugs increases the urinary excretion of adderall, thus reducing the plasma concentration of drug and its efficacy. Methamphetamine is the derivative of amphetamine and is a potent CNS stimulator. However, it is much more potent than amphetamine with a higher abusive potential. Because of its strong potency, methamphetamine is commonly used as a drug of abuse. Even the chances of side effects with this drug are quite high. Despite the abusive potential of methamphetamine, low doses of this drug are used to treat psychiatric disorders. The IUPAC name for methamphetamine is N-methyl-1-phenylpropan-2-amine. Rarely used for treating obesity when all other medications fail to reduce it. For children above 6 years of age, the recommended dose is 5mg once or twice a day initially, followed by the increase in dose of 5mg after every week. The total dose should not exceed 25 mg to avoid the risk of side effects. However, the use of this drug is not preferred over a prolonged period of time. For treating the obesity in adults, 5mg of tablet can be taken an hour before taking the meal. Methamphetamine should not be used for treating obesity in children because of strong adverse effects. Methamphetamine comes in the tablet forms with a strength of 5mg. Methamphetamine tablets should not be crushed or chewed. Swallow the whole tablet with a glass of water. Always read the label of medicine before taking it. Make sure that you are taking the recommended dose of the drug as prescribed by the doctor. Never share this medicine with any person having same symptoms without taking the doctor’s advice first. Do tell your doctor if you have any previous history of thyroid disease, heart disease, mental illnesses, vascular disease, diabetes and seizures. Methamphetamine should not be taken by pregnant and lactating women. Do not discontinue use of the drug without asking the doctor as suddenly stopping the drug intake may cause withdrawal symptoms. If you see that the drug is interfering with child’s growth, then consult with the doctor. Do not give medicine to the children under the age of 6 years. The action mechanism of methamphetamine is quite similar to amphetamine but, the potency of methamphetamine is higher than amphetamine. Methamphetamine inhibits those transporters that are involved in the reuptake of dopamine, epinephrine and nor-epinephrine, thus increasing their concentration in the neuronal synapse and potentiating their effect. Apart from this, methamphetamine stimulates the intracellular stores of these neurotransmitters, triggering their release in the synapse. When the concentration of these neurotransmitters is increased, the neuronal brain activity is enhanced with a significant improvement in behaviors, alertness and cognitive functions. However, in patients with exogenous obesity, methamphetamines induce anorexia that help obese patient reduce their food intake and obesity. For therapeutic purposes, oral route of intake is preferred. When taken orally, the drug is rapidly absorbed through the gut. With oral route, the bioavailability is about 70 percent. The peak plasma concentration reaches within 2-3 hours of intake. As it is a lipid soluble drug so it can easily cross the blood brain barrier and enter the brain tissues. 30 percent of methamphetamine is excreted as such whereas the rest of it is metabolized by CYP2D6 enzymes of the liver. Unchanged form and metabolites of methamphetamine are excreted through urine. The plasma half life is about 10-12 hours depending upon the urinary pH. Higher the pH, lower will be the excretion and longer will be the half life of drug. Trembling or shaking of legs and arms. Concurrent use of MOA inhibitors and methamphetamine should be avoided as they can potentiate its side effects. Same is the case with antidepressant drugs which increase the risk of side effects of methamphetamine. Use of multivitamin supplements and herbal supplements should be avoided as they can have significant drug interactions. Methamphetamine show significant drug interactions with histamines. Histamines potentiate the effects of methamphetamine. Chlorpromazine tends to reduce the drug efficacy by inhibiting its activity. After discussing everything in detail about methamphetamine and adderall, it can be easily concluded that adderall is preferred over methamphetamine. If a choice has to be made between adderall and methamphetamine for the treatment of psychiatric disorders, then obviously the drug of choice will be adderall as it has lesser abusive potential than methamphetamine. Methamphetamine, on the other hand, tends to pose high risk of addiction and adverse effects (10, 11).